Spotify Technology SA shares climbed from their reference price after it began trading through a direct listing. The company skipped the traditional initial public offering process in favor of a route rarely taken by large, established companies. The stock rose 19 percent to $156.80 at 2:07 p.m. in New York from the $132 reference price set by the New York Stock Exchange well before the price discovery process started. While not an offer price, that was the threshold number set by the NYSE as the minimum for the process to begin. Its first true public valuation based on share supply and demand was the open price of $165.90. From there, the stock is down 5.5 percent. Based on the total number of shares outstanding after the listing, Spotify has a market value of about $27.8 billion. Spotify isn’t selling any shares and there’s no lockup period for company insiders or, with one exception, current shareholders. That means the company’s first public share price, the open price, was set based purely on supply from existing shareholders wanting to sell stock and demand for those shares. That’s in contrast with an IPO, in which the company and potentially a few existing shareholders offer a set number of shares at a valuation they think the market will bear. Then underwriters hammer out how many shares investors want and at what price. 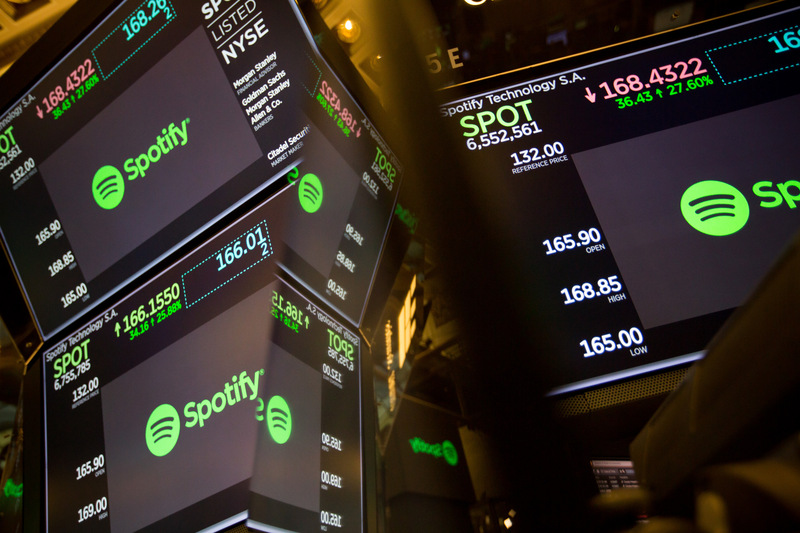 Spotify’s stock got off the ground with the help of advisers Goldman Sachs Group Inc., Morgan Stanley and Allen & Co. and designated market maker Citadel Securities LLC. Morgan Stanley was mandated to help Citadel Securities determine the open price based on supply and demand intel gleaned from conversations with existing and potential investors. The shares are trading on the New York Stock Exchange under the ticker SPOT.